Description This chapter describes dermoscopyThe examination of [skin lesions] with a 'dermatoscope'. This traditionally consists of a magnifier (typically x10), a non-polarised light source, a transparent plate and a liquid medium between the instrument and the skin, and allows inspection of skin lesions unobstructed by skin surface reflections. Modern dermatoscopes dispense with the use of liquid medium and instead use polarised light to cancel out skin surface reflections. of Dermatitisalso known as eczema is a group of diseases that results in inflammation of the skin. Dermatitis, General medicine Dermatitis – cite! Dermatitis (message) Dermatitis – participate! Despite their variable etiopathologies, all forms of dermatitisalso known as eczema is a group of diseases that results in inflammation of the skin. show similar histopathologic just as similar dermoscopic characteristics. Dermatitis usually exhibits red dots in a patchy distribution and yellow scales. The red dots are identical to the vesselsThis glossary term has not yet been described. in psoriatic lesions, but unlike psoriasisThis glossary term has not yet been described., their distribution is not homogenous and regular, but rather clustered, generating an irregular, “patchy” pattern. SuperficialThis glossary term has not yet been described. scaling is a frequent characteristic of dermatitis, but opposed to psoriasis and other erythematosquamous skin diseases, the scales in dermoscopy of dermatitis reveal a yellow color either alone, or in combinationThis glossary term has not yet been described. with white. 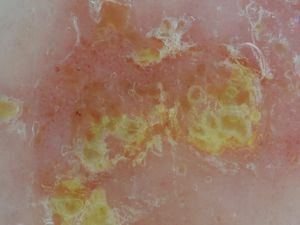 Belonging to the group of the characteristic yellow scales, the “yellow clod sign” is frequently observed in nummular eczema. Notably, yellow scale color is dermoscopically detected not only in acute, but also in chronic dermatitis. Contact dermatitis, nummular eczema, generalized dermatitis, chronic dermatitis, seborrheic dermatitisThis glossary term has not yet been described. and other subtypes were reported to reveal similar findings in dermoscopy, but further investigation on their specific pattern is needed. ↑ 1.01.11.21.3 Lallas et al. : Accuracy of dermoscopic criteriameasure of how well one variable or set of variables predicts an outcome for the diagnosisis the identification of the nature and cause of a certain phenomenon. Diagnosis is used in many different disciplines with variations in the use of logic, analytics, and experience to determine "cause and effect". In systems engineering and computer science, it is typically used to determine the causes of symptoms, mitigations, and solutions of psoriasis, dermatitis, lichen planus and pityriasis rosea. Br. J. Dermatol. 2012;166:1198-205. PMID: 22296226. DOI. ↑ Navarini et al. : The yellow clod sign. Arch Dermatol 2011;147:1350. PMID: 22106141. DOI. ↑ Vázquez-López et al. : Dermoscopic semiology: further insights into vascular features by screening a large spectrum of nontumoral skin lesions. Br. J. Dermatol. 2004;150:226-31. PMID: 14996092. ↑ Lallas et al. : DermoscopyThe examination of [skin lesions] with a 'dermatoscope'. This traditionally consists of a magnifier (typically x10), a non-polarised light source, a transparent plate and a liquid medium between the instrument and the skin, and allows inspection of skin lesions unobstructed by skin surface reflections. Modern dermatoscopes dispense with the use of liquid medium and instead use polarised light to cancel out skin surface reflections. of early stage mycosis fungoidesThis glossary term has not yet been described.. J Eur Acad Dermatol Venereol 2013;27:617-21. PMID: 22404051. DOI. This page was last modified on 11 November 2017, at 18:06.